Welcome our Executive Director, Dan Christian Ghattas! Today OII Europe announced the organisation’s first paid position. Dan Christian Ghattas was chosen by the Steering Board to take the position of Executive Director. “This is a big step for OII Europe”, says Co-Chair Miriam van der Have. 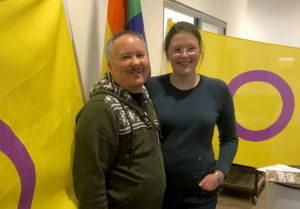 “Dan will continue our fight for the human rights of intersex people, and this new position will help building our capacity as an organisation”. As of today Dan Christian Ghattas has resigned from his former position as OII Europe’s Co-Chair. Kitty Anderson, OII Europe’s secretary, has been chosen by the Steering Board to temporarily serve as Co-Chair until the organisation’s General Assembly on the 17th of March.